Methamphetamine is a powerful stimulant, with over 5% of Americans aged 12 and older using the drug at least once in their lifetimes. Methamphetamine is one of the most dangerous, illicit drug addictions because its components are so caustic, and its effects on the user are incredibly harsh. The drug will affect numerous bodily systems, including the skin, teeth, cardiovascular system, and kidneys. Methamphetamine addiction is also difficult to hide because the drug will eat away at the user’s teeth and cause open skin sores, which can create their own unique set of health consequences. Meth is a highly addictive substance and creates an intense, short-lived high. Because methamphetamine interacts with powerful brain chemicals, serotonin, and dopamine, it gives the user a euphoric and robust rush, and users will continue to use the drug to keep from coming down from the euphoria. Unlike other drugs like cocaine and heroin, methamphetamine cravings are much more intense. Users will sometimes go on what’s called a ‘run,’ where they continually ingest the drug for long periods of time until they run out of supplies, or worse, overdose. Methamphetamine can be snorted, injected, eaten, or smoked. Users may leave behind small bags of white powder or pieces of foil or syringes. Disassembled ball-point pens may be left behind since the hallowed-out shafts can be used to snort methamphetamine. When smoked, methamphetamine will give off a pungent odor, like the smell of burnt plastic or cleaning chemicals. User’s pupils will appear dilated when under the influence of methamphetamine. Methamphetamine can cause dangerous overheating and can induce a heart attack, convulsions, stroke, and eventually, death. Long-term effects of methamphetamine are horrible for the user. They may experience chronic depression and anxiety, as well as memory problems and psychosis. Methamphetamine is made of harsh and caustic chemicals, and the effects on the body are hard, aging many users well beyond their years. How and why does meth mouth happen? 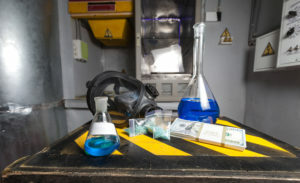 Because of the harshness of methamphetamine’s chemical makeup, when users ingest the drug, these harsh agents eat away at soft and hard tissues. The acid in the drug will wear down the user’s tooth enamel, leading to rapid decay. Also, the gums will bleed and pull away from the bottom of the tooth, in effect loosening it. Many survivors of meth addiction experience tooth loss directly related to past drug use. Why does meth cause itchy skin? Chronic meth use causes the user to experience extreme paranoia and in some cases, hallucinations. Also, long-term meth users report experiencing tactile sensations, or the feeling of ‘bugs crawling beneath the skin.’ With these sensations, coupled with paranoia and faulty thinking, users will compulsively pick and scratch at their skin. Drug addiction causes the user to stop taking care of themselves. Often, the picking and scratching lead to open sores, which become infected. Users will not seek treatment for these sores, and many active meth users will present with numerous scabs and open wounds on their faces, arms, and legs. Open, infected skin sores can cause other adverse health consequences, such as staph infections and more severe cases, MERSA or septicemia. Methamphetamine addiction is deadly and can cause long-term, adverse health effects on the recovered addict. But the sooner a person seeks treatment, the less likely they are to experience life-long problems related to meth use. In a rehabilitation facility, users can detox in a safe environment under the supervision of medical staff. Since methamphetamine cessation can cause depression and psychosis, it is not recommended that users attempt to detox at home. In a medical facility, doctors can prescribe safe, legal drugs to lessen the effects of methamphetamine withdrawal, lowering the risks of relapse. After detox, patients can receive the care they need from trained counselors so they can live a life free from the dangers of methamphetamine addiction. In therapy, counselors help individuals cope with life stressors and adverse events with emotional resilience and positive thinking and reinforcement. Equipt with these new skills, people in recovery are less likely to relapse and can move on with their lives once a methamphetamine addiction is broken. Addiction to methamphetamine is a pernicious, stubborn substance use disorder and particularly hard to recognize when a person makes an effort to hide their abuse of this highly addictive substance. Fortunately for friends and family of the one affected, there are some revealing indications and early signs of methamphetamine addiction to look for. If you or someone you care about is abusing meth, call us at 855-491-7694. We want to craft a completely personalized addiction treatment program to help you or the one you care about regain his life. Meth abuse is essentially a dangerous undertaking. Since it’s an illegal drug, often a user doesn’t realize what dose they are using. A person can just as easily overdose; regardless of the manner, they are using the drug. Complications of methamphetamine abuse are many and varied. Sometimes, it depends on the manner a person is consuming the drug. Complications such as “meth mouth”, nosebleeds, lung infections, and difficulties swallowing may occur in some people who smoke meth. For those injecting, a higher risk of contracting HIV or hepatitis C is a possibility. Other long-term effects of meth use include malnourishment because methamphetamine use can seriously curb a person’s appetite. Just as frequently, often meth abusers will pick their skin to get off “bugs” crawling under them. Psychosis is also a serious possibility. Windward Way’s clinically supervised meth detox center and drug rehab can help you regain a meth-free life. Since our highly trained intake experts are available at all hours, there’s no excuse not to call 855-491-7694. Rediscover yourself, the Windward Way—get your life back.